NEW PRAGUE, Minn., January 7, 2016 - Last January, Cedar Summit Farm in New Prague closed its doors. It was the only certified 100 percent grass-fed dairy producer in the state. Kendra Rasmusson, originally from the New Prague area (St. Patrick), had recently moved back to the area from the Twin Cities with her husband, Paul. They were seeking a place with a stronger sense of community where they could raise their family. The closing of Cedar Summit Farm prompted the Rasmussons to start exploring if this was an opportunity to open their own local foods market. Farmhouse Market is not your typical grocery store. 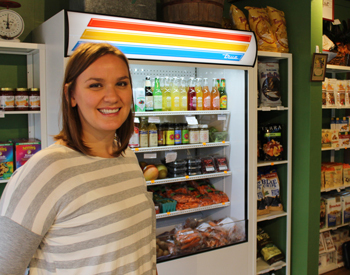 “At first, we started thinking about opening a traditional grocery store that would carry local and organic produce, which, based on a marketing analysis survey, we knew there was a demand for,” said Rasmusson. “However, the survey also indicated that more than anything else, people wanted a store that offered convenient hours.” After crunching the numbers, the Rasmussons knew they had to get creative if Farmhouse Market was going to be open hours that pleased everyone while still making any kind of profit. Rasmusson received a loan from Southern Minnesota Initiative Foundation’s Local Foods Loan Fund. In addition to receiving free business consulting from Scott County’s Open to Business program, she’s also been working with SMIF’s Business Specialist John Katz to set up QuickBooks to manage the cashflow and business relationships with the more than 15 local vendors she works with. The store has everything from local produce and dairy products to grass-fed meats and cheeses, all-natural health and beauty products, locally roasted coffee, and gluten-free flours and mixes. Members pay with credit or debit cards using a simple self-checkout system. “If you can use an iPad, you can figure it out,” said Rasmusson, who also provides a help number should anyone need assistance. Beyond providing local foods and goods, Farmhouse Market has a second floor with a sunny community room. Rasmusson envisions this as a flexible community space that members can use for things such as cookie exchanges, book clubs, art classes, a homeschooling network space, or a CSA drop-site. Farmhouse Market is located at 120 W. Main St. in New Prague. The store’s public hours are noon to 3 pm Tuesdays; 3 to 6 pm Thursday, and 9 am to noon Saturdays. Membership is $99 for the first year and $20 annually to renew. Members have 24/7 access to Farmhouse Market, including the community room (with WiFi), 5 percent off purchases, and 10 percent off bulk purchases. To learn more about the market, including a listing of all local vendors and to purchase membership, visit their website at www.farmhousemarketnp.com.